With England Under-21s about to play in the 2015 European Championship, we recall the period when they enjoyed dominance in the competition. In 1982 England became European champions and two years later they did it again, helping propel players such as Mark Hateley towards the full international ranks. In the mid-1970s, under-21s football replaced the traditional under-23s as the main feeder into the senior international set-up. The newly-created UEFA Under-21 Championship saw England immediately emerge as a front-runner and in the first tournament in 1978 they lost at the semi-final stage to Yugoslavia. Two years later Bryan Robson scored in the quarter-final win over Scotland before they again fell at the semi-final hurdle, this time to East Germany. Six months on from that disappointment, the latest crop of under-21 players began their quest for glory in October 1980. Clive Allen gives chase during England’s horrendous start to the 1980-82 Under-21 championship away to Romania. There was certainly little indication of what lay ahead when England began their qualifying tournament for the 1980-82 competition. The process would mirror the 1982 World Cup qualifying campaign for England’s first-team in terms of opponents and scheduling, although Norway were not in the under-21 competition. When England kicked-off the qualifiers in October 1980, they were given a rude awakening with a 4-0 thrashing in Romania. It could have been even worse, with the home side missing a penalty and hitting the woodwork. it was the start of a bad 24 hours for England, as their seniors lost to Romania the following day in a World Cup qualifier. Both present and future prospects looked bleak for Ron Greenwood. Under-21s boss Dave Sexton rang the changes for the next match against Switzerland and England triumphed 5-0 at Portman Road as further good results followed. Like the seniors England went into their final qualifying match needing a draw at home to Hungary to progress. Goals from Garry Thompson and Justin Fashanu gave them a 2-0 win at the City Ground in Nottingham. The two goalscorers embodied the emerging presence of black players in the England ranks, with a good number featuring prominently in the under-21s teams of the early 1980s. There was no tournament as we know it today for the finalists and the last three rounds would be played over two legs. Goals from Paul Goddard and David Hodgson helped England win 2-1 in Poland, with Mark Hateley’s double in the return match at West Ham’s Upton Park sending England through 4-3 on aggregate. Goalkeeper Iain Hesford proved a hero with a penalty save in the closing minutes. This set up an intriguing semi-final against Scotland, with the first leg at Hampden Park attracting more than 16,000 fans. Thompson’s goal gave England the advantage, although the tie was marred by the red cards shown to Hateley and Ray Stewart of Scotland following a scuffle near the end. Despite being without Hateley’s aerial prowess, England advanced to the final after Adrian Heath scored in a 1-1 draw in the return at Maine Road. The managerial duo of Dave Sexton and Terry Venables with the Under-21s trophy won in 1982, flanked by FA bigwigs Ted Croker and Bert Millichip. The final was held over until the opening weeks of the 1982-83 season, pairing England against West Germany. At Bramall Lane England turned in an impressive display to win 3-1, with Gary Owen (2) and Fashanu finding the net. In the second leg the following month, West Germany showed how seriously they were taking the competition as established first-team member Pierre Littbarski played for their under-21s and then featured for the seniors in a friendly at Wembley the following night. He scored a hat-trick in Bremen past Hesford, but Mike Duxbury and Goddard were on target for England as they sealed a 5-4 aggregate success and could savour trophy glory. 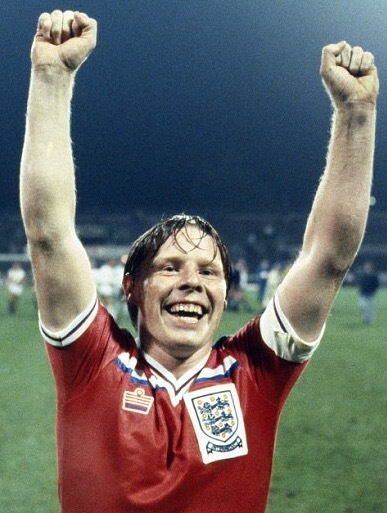 Joy for Sammy Lee as England win the 1982 title – he would soon have further cause to smile as he joined the senior squad. 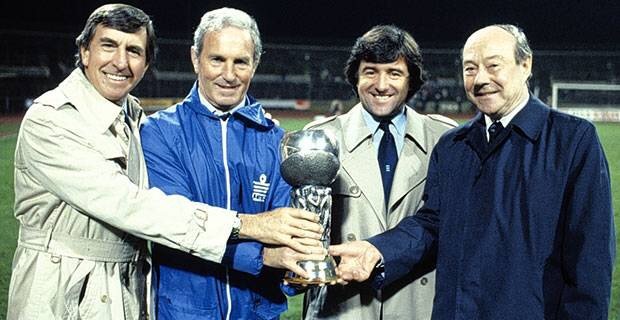 It meant new England manager Bobby Robson had seen an English team win silverware just weeks into the job, but the credit lay with the managerial duo of Sexton and Terry Venables who had led the team to a success few would have anticipated during that hammering in Romania two years earlier. A high number of players had featured along the way, including the likes of Clive Allen, Gordon Cowans, Terry Fenwick, Sammy Lee, Danny Thomas and Chris Woods who would all go on to play for the seniors. “This is the proudest I have ever been,” purred Sexton after the triumph. Lee came in for particular praise in the media and he would play and score for the senior side the next month in Greece in a European Championship qualifier. But for Hesford of Blackpool in Division Four, he feared there would be no more international stardom. “I know my international career is as good as dead if I don’t get out of the Fourth,” he said in the wake of the final. Sadly, his only involvement in a match featuring the England seniors would be playing against them for a Hong Kong Golden Select XI in the build-up to Euro ’96. A quirk of the under-21 competition was on the day the first-leg of the 1982 final was taking place, the qualifying series for 1984 was getting under way. With Sexton leading the 1982 finalists, Howard Wilkinson looked after the team in Denmark and Gary Mabbutt scored twice in a 4-1 win. Although a surprise defeat followed in Greece, England went on to qualify with five wins out of six and a new crop of talent having emerged. The Luton Town forward pair of Brian Stein and Paul Walsh were linking up well and the final seven goals England scored in the qualifying campaign all came from the duo. Robson would select them together for England’s seniors when they met France in a friendly in February 1984. Their presence in that match meant they could not play for the under-21s in the first-leg of the quarter-finals against the French at Hillsborough. But England coped perfectly well without them, as Hateley scored four in a 6-1 win. His penalty brought victory in the second-leg, as England went into an appealing semi-final with Italy. In his World Cup Diary book covering 1982 to 1986, Bobby Robson – who calculated England used 42 players en route to triumphing in 1982 and 39 for their 1984 campaign – recalled that Newcastle United manager Arthur Cox refused to allow the exciting attacking pair of Peter Beardsley and Chris Waddle to play against the Italians as their club chased promotion from Division Two. Instead Ipswich Town’s Mich d’Avray took his place in the side and he scored in the first-leg at Maine Road in a 3-1 win. The return in Florence was always going to be tough, with future Manchester City manager Roberto Mancini reducing the deficit. But England held firm to progress with a 3-2 aggregate victory. Delight for five members of England’s class of ’84 (from left): Steve Hodge, Paul Bracewell, Dave Watson, Mark Hateley and Nigel Callaghan. For Sexton, who lost his job at Manchester United and then at Coventry City in the early 1980s, his success with the under-21 side proved a welcome tonic. He may have been merely a ‘nearly man’ when league title pushes ended in disappointment at QPR and United, but with England he was proving himself as a winner. He would remain in the role throughout the Robson era. A week later Bramall Lane hosted the return game, with Hateley and Howard Gayle finding the net within a minute of each other early in the second half to seal a 3-0 aggregate victory. For Hateley it was the start of an incredible summer that began with him playing for Second Division Portsmouth and ended with him signing for Italian giants AC Milan. In between he broke into the England senior squad and scored in a famous 2-0 win over Brazil. Along with other under-21s players such as Gary Bailey, Steve Hodge and Gary Stevens, he would take his place in the 1986 World Cup squad in Mexico. Mark Hateley helps seal the 1984 title for England, celebrating his goal in the second-leg of the final with Steve Hodge. By the time of the 1986 World Cup, England had come perilously close to a hat-trick of under-21 titles. In 1986 they reached the semi-finals, coming up against Italy. Emerging stars Roberto Donadoni and Gianluca Vialli (pen) scored for a strong Italian side during the first-leg in Pisa to leave English hopes hanging by a thread. The return game was held at a muddy Swindon, with England given cause to believe as Stewart Robson scored. But Vialli equalised to kill the tie and end England’s hopes of three successive titles. And with another semi-final loss to an Eric Cantona-inspired France in 1988, the rot was setting in with England’s youngsters having now experienced their own 30 years of hurt (and counting) in their bid to regain the European crown. They came close to being champions in 2007 when they lost a mammoth penalty shoot-out in the semi-final to the hosts Netherlands and two years later they reached the final, when they were crushed by an impressive German side. In the Czech Republic can Gareth Southgate at last lead the under-21s to European glory and revive the glory days of the early 1980s?